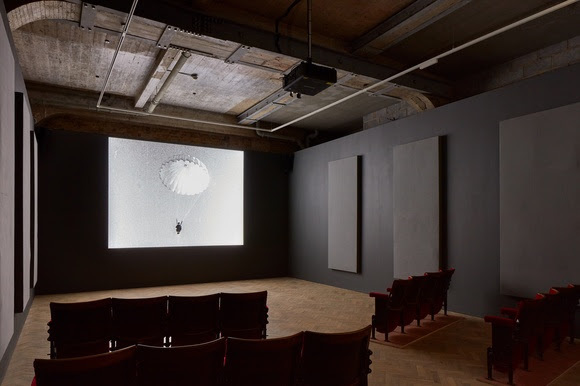 Bruce Conner's ground-breaking first film A MOVIE (1958) will be extended until July 15th at 3 Duke Street, St James's. "When I look at MTV, it seems they must have been students of Conner… In the history of art, Bruce Conner will have to be recognised as being one of the great innovators of the Twentieth Century." After the presentation of Bruce Conner's CROSSROADS in June 2015, Thomas Dane Gallery introduces A MOVIE (1958), the artist's first ever film work, to its London audience. Hitherto known for his found assemblage works, Conner was one of the most versatile and unpredictable artists of the post-war era, working in photography, painting, drawing, sculpture and film. A MOVIE is the first ever "assemblage film", combining different sources with rapid-fire editing techniques invented by Conner himself, establishing the artist as a pioneer of the genre. Without ever owning or making use of a camera, Conner re-interpreted Jean Dubuffet's open-ended concept of assemblage to the filmic medium: found footage, some of it being discarded 16mm films purchased at flea markets, or scavenged from camera shops, was assembled to make a moving image work. Defying premeditations of typical filmmaking, Conner counters conventions of the everyday cinematic experience, as he marks the opening of A MOVIE by inserting the headers 'End of Part Four' - a random signifier that from the very beginning turns the structure of film on its head. The subsequent numerical countdown in the formal film leader is followed by the unexpected interruption of a woman taking off her tights. Here, Conner already denies the viewer the thrill of voyeuristic fulfilment, typical for these 1950s striptease scenes. According to Jean-Luc Godard "all one needs to make a movie is a girl and a gun," - a quote that perfectly encapsulates A MOVIE's seemingly casual yet infamous montage. Upon first review, what follows this unusual opening may appear as a cacophonous juxtaposition of narrative and spatially unrelated shots of iconic imagery: clips of mass destruction, car crashes with drivers dismembered and mutilated, shivering malaria victims and Mussolini's body being hung up at the Piazzale Loreto are interspersed with delicate images of acrobats walking a tight-rope or parachutes floating in wide skies. Over the course of 12 minutes, these scenes (some of them signifiers of American mass culture, which Conner felt alienated from and stood in opposition to throughout his entire career) unfold into a kinetically masterminded apposition. Much in alignment with his contemporaries like Andy Warhol and Stan Brakhage, film as a pure medium had great significance to the artist and his undertakings in the world of moving image reflect the 1960s structural filmmaker's strive to bring material qualities of film to the foreground. However, contrary to Warhols' tendency to focus on silence and stasis, Conner put emphasis on the medium's ability to translate energy, reminding the viewer that film is nothing but celluloid - a carrier material that reacts to light. A MOVIE's actual subject matter is the editing itself: splicing film, rhythmically and kinetically re-assembling clips replaced glue as the means of holding an assemblage together. Where Conner's imagery unapologetically addresses the viewer's emotions, he extends and exalts the visual impact by his choice of music. Ottorino Respighi's Pines of Rome, with its intrinsic dynamism, could easily destroy the potency and coherence of image; but instead Conner's astute choice of sound excerpts and enhances the drama inherent in each found scene. Conner's cinema refashions film and television images into haunting and illuminating textures that unleash and channel the inner, unconscious forces at work within cinema and popular media. A MOVIE is a masterpiece of sensory evocation and carries in its seeming simplicity the weights of Conner's criticism on consumer society and its destructive patterns.